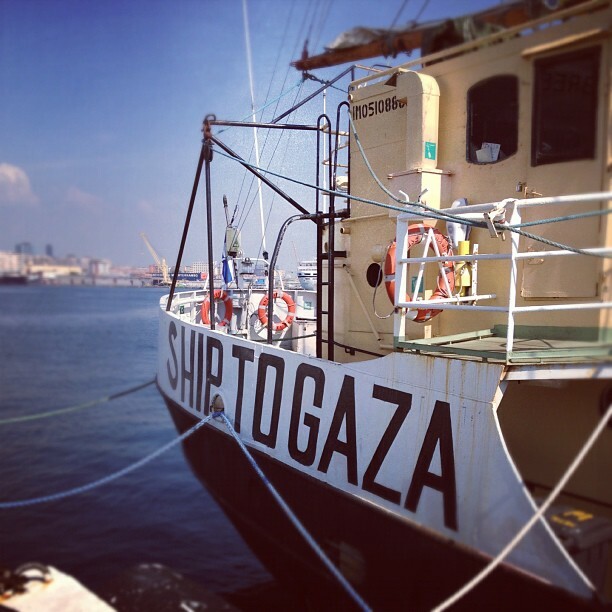 Follow the Estelle Freedom Boat sailing now to Gaza. We call to all the leaders of the world to take a stand for justice, truth and peace. 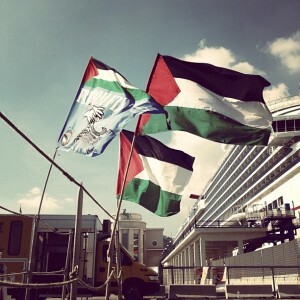 Israel has placed an illegal blockade in Gaza Palestine with the excuse to stop weapons to enter the besieged Gaza Port. We wonder who stop Israel from manufacturing weapons of all calibers even nuclear weapons. Who has an eye on Israel?, Why the UN stay silence on the issue of the illegality of the Blockade and why does not take measures to enforce the Resolutions against Israel. Please Stand for what is right. Now is the time to take a stand for Justice. Palestine need the voices of all the world to end once and for all the Apartheid Entity that has ravaged the land and the lives of millions Palestinians. Please activists of peace, all the people that belong to the Solidarity Movement do not forget the Mavi Marmara. More than 2 years and justice has not been brought to the victims of that massacre. Keep raising your voices, do not allow tricks, and minus controversies to take away your attention from Palestine. Every time that there is a mission in the making someone from somewhere start a rumor of no importance what so ever to derail the mission. All Palestinians supporters unite in one voice. Remember Vittorio Arrigoni, Rachel Corrie and the Palestinian Martyrs every time you read the news and you see nothing about Israel crimes in Palestine, it is our moral duty to make the news for Palestine. Every computer it is weapon against the silence. Hasbaras get paid to create rumors, don’t give attention to them. We already know those tactics, please do not follow it. If you are Palestinian lover, supporter of Justice and peace leave personal vendettas out of the movement. Gaza situation is unsustainable and needs to be open to the world. Voluntarism is a moral duty that we all humans feel the necessity to express, we have no obligation but only the love for our fellow human family. From my part I send my gratitude and thanks to all the peace activists that leave the comfort of they everyday life to participate in this global effort to free Gaza. 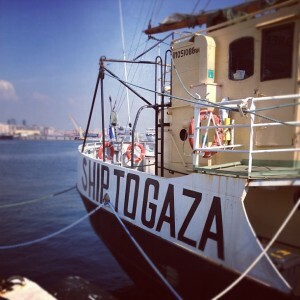 On Sunday , 2012 The Estelle Ship sailed out from Naples to Gaza, Palestine destination. Against all the odds, that the Boat faces, the crew is optimist that this time, they will brake the illegal Israel blockade of Gaza, that has been in place since 2007 with the silence of the leaders of the world, and the grin of the UN block. A demonstration that assembled several hundred participants marched through the central parts of the city and then collected in the port where Estelle loaded the last items and completed the last paperwork. An unparallelled atmosphere of festivity reigned, and people danced, sang and cheered uninterruptedly. When the Italian harbor board let us load the 300 footballs that had been stored in Athens for the last year the enthusiasm knew no bounds. In spite of Israeli pressure to stop Estelle from leaving the port the Italian authorities remained unmovable. On the previous days the Israel prime Minister trying to bully the Free Gaza voyagers issued an statement on their media. During the days in Naples the ship protected at all the times. 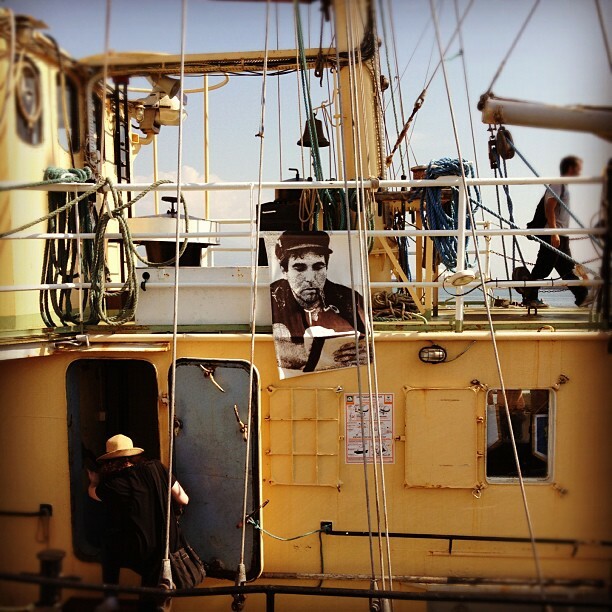 The lessons from the other flotillas still fresh. No saboteurs had found their way to the schooner, but loads of enthusiastic sympathizers did. 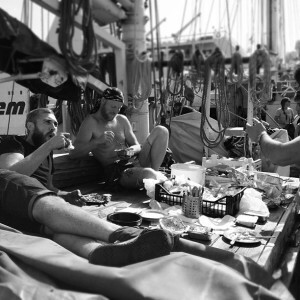 That Estelle now made out for the last stretch of the 5000 nautic miles from the start in the Baltic Sea does of course not mean that we have reached our goal. The blockade is still there. But the resistance is growing, every hour, every day, every week. 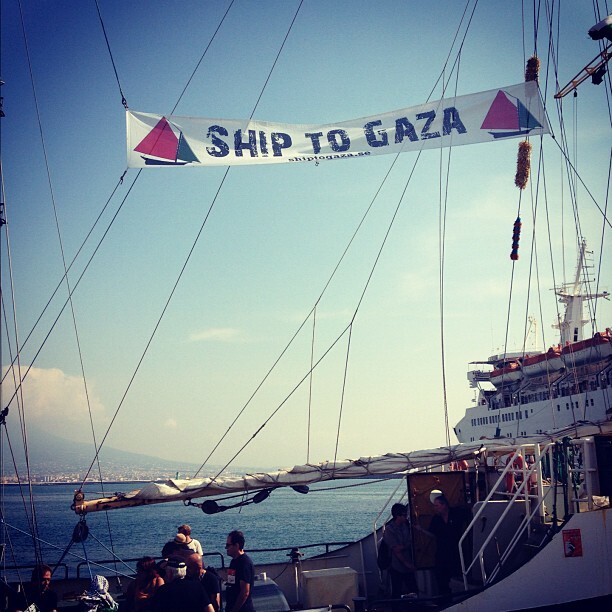 Naples was the last stop on the mainland before heading to the Gaza blockade. 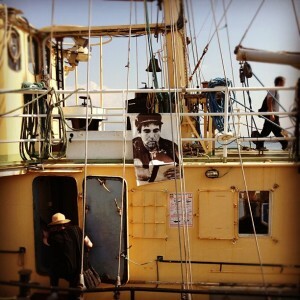 The ship left the port on Sunday afternoon while dozens of people greeted the crew and sang songs, while Dror Feiler, accompanied The Estelle farewell with his saxophone. 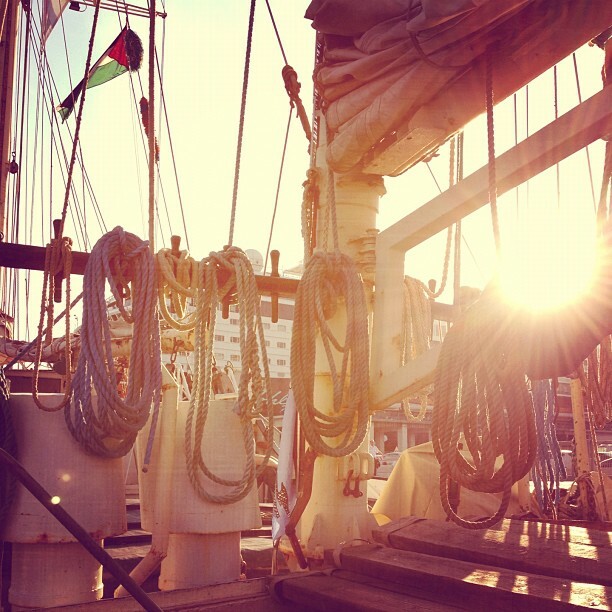 The Estelle is an old boat reconstructed ready to sail again thanks to donations from Palestinian’s lovers around the world. attraverso l’uso di metodi nonviolenti.